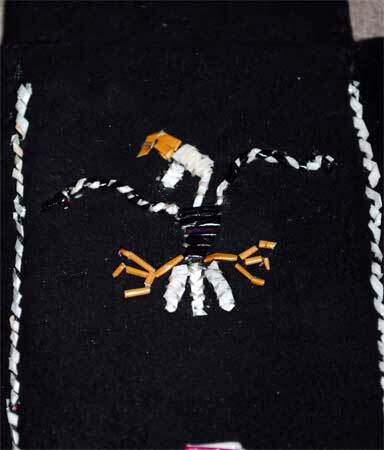 The eagle design consists of natural and dyed porcupine quills embroidered onto black deer skin. Every week I begin with the intention of posting another blog entry and before I know it another week has passed. I’m not sure where the time goes, but I need to find an easier way to get my photos up and get posting. Any suggestions? The eternal struggle, I suppose, of intention versus time available. 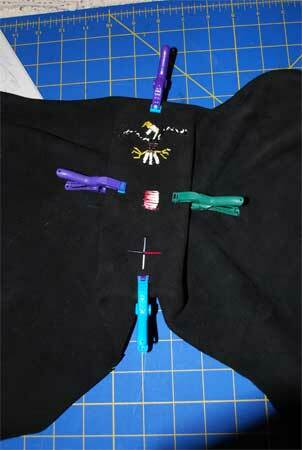 Here are some more details on the custom knife sheath I embroidered with porcupine quills for a customer recently. Proud recipient: Corrine in her regalia holding her new eagle knife sheath. Corrine conceptualized the idea of the knife sheath. She bought the eagle head knife at a powwow last October and then moseyed over to my quillwork demonstration and inquired about a custom knife sheath to keep it safe. Corrine knew exactly what she wanted: the colors, the design, all in an effort to match her black and white regalia. I was intrigued by the new project. Ready, set, cut! Stiff leather the shape of the knife act as the inner core of the sheath and keep it rigid. Of course when I got home, the reality set in: I knew how to do porcupine quillwork, but I didn’t know the first thing about making a knife sheath. I consulted a friend who’s an ace at such things after years of trial and error. His Cliff Notes version of knife sheath construction sent me in the right direction. Quilling the design onto leather. I started taping my fingers to save them from needle pricks. The tan object on my middle finger is a leather thimble from Alaska. The sheath has 6 layers of leather in all. Two thick pieces of leather act as stiff cores, and then I sewed a layer of deerskin onto the front and back of each core with glover’s needles and waxed nylon thread. After quilling the design onto the deerskin, I glued the leather to the stiff core so it didn't move while I stitched it. The frontpiece of fringe and quillworking are one solid piece of leather. First I quilled the design in the middle. Next I sandwiched the thick core leather between the design piece and a deerskin backing and stitched. Hot glue and clamps held the piece in place while I stitched the pieces together. 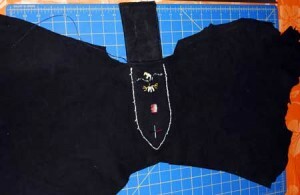 Now I had a complete back and a complete front, but I still had to stitch those together to make a pocket for the knife. 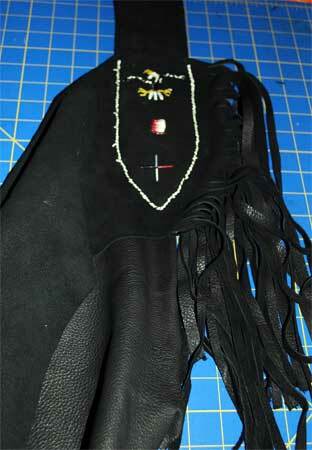 As I stitched the front and back of the knife sheath together, I added the white quillwork edging. Talk about multi-tasking! 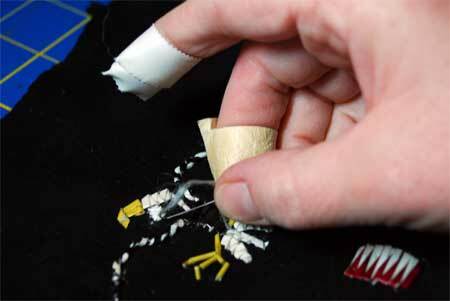 Pushing the needle through all the layers of leather was tough on my fingers, but wearing a thimble on every finger was clumsy so I started taping my fingers with waterproof tape, which gave me some amount of protection. The knife sheath is sewn together. Now it's time for fringe. 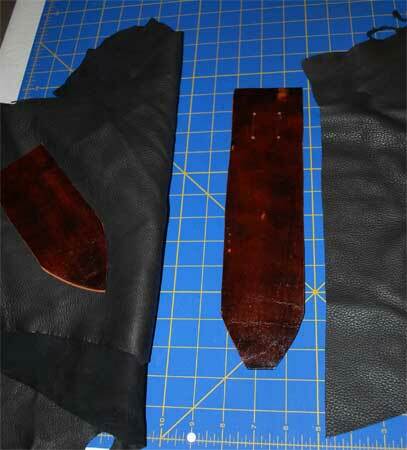 I eventually cut the "wings" off the leather so the top piece is essentially a rectangular. Cutting the fring was my favorite part. It transformed the the project into a completed work. Or maybe it just reminded me of the fringed black suede keychain with silver roses I had in high school. I wonder where that got to. Maybe I’ll have to whip up a new one with the extra leather.